The Health Service Executive (HSE) has announced the appointment of 212 Access Officers across its Health and Social Care services. Access Officers support HSE staff in dealing with access issues for patients and service users with a disability. They are now in place in all Acute Hospitals, Community Healthcare Organisations (CHOs), the National Ambulance Service, the National Cancer Screening Programme, and in the Primary Care Reimbursement Service (PCRS). The HSE stated that it is aware of gaps in the way that health services are provided, and that some healthcare facilities pose challenges in their accessibility to people with disabilities. In order to make a patient or service user’s journey through health services easier, Access Officers will systematically address such gaps, ensure that future services and facilities comply with national standards and legislation, and work to make all services and facilities fully accessible to all. To view the names, contact details and locations of the newly appointed Access Officers, please click here. 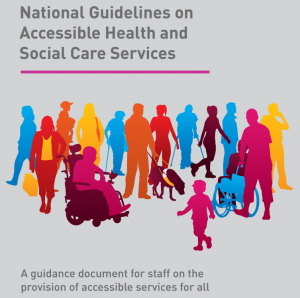 The HSE published its National Guidelines on Accessible Health and Social Care Services earlier this year: click here to read those guidelines.